Below is an article Charles Hickenbottom wrote about his somewhat recent stay at Sun Mountain Lodge and the surrounding area. Charles is able to link his thoughts of cross country ski trails around Sun Mountain and the Methow Valley during a season without snow. Although this is a bit out of our range at WenOut we still feel this is an appropriate article to post for its historical nature and close proximity to our stomping grounds. This fall (October, 2016) was my ﬁrst time back in the Methow Valley since last winter when I completed my three-year book project, Cross Country Ski Trails in the Methow Valley – A Study of Trails and Mapping. My wife Janet was attending a workshop at Sun Mountain Lodge. I was along to provide “double occupancy” for our lodging, giving me ample time to do some exploring on my own. The weather was nice and I had a couple of hours available on a Friday evening before it got dark. The Chickadee Trailhead was nearby and would serve my needs for a short hike to Herringbone Hill (Point 3152’, USGS Thompson Ridge). The mostly open slope of the north ridge was visible from our second-story lodge window. 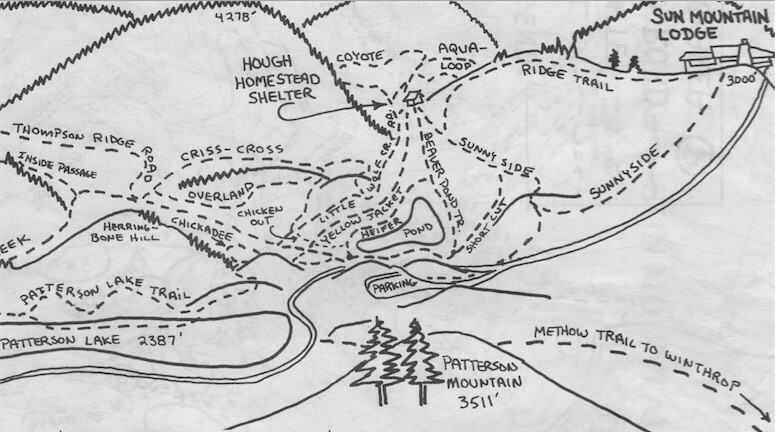 I learned about Herringbone Hill from a map (“Sun Mountain,” 1979) drawn by Don Portman. Back in the 1970s Portman began the cross country ski program at Sun Mountain and had a myriad of duties, including the job of cartographer. Don labeled this small hill located between Patterson Lake and the Chickadee Trailhead on his map, and marked it as a backcountry telemark ski route. Over the years the Methow Valley cross country ski trail system evolved, as did the maps that showed the trails. Backcountry ski routes were gradually removed from the cross country ski maps, and Herringbone Hill fell into obscurity. I started on the Chickadee Trail, ironically hiking one of the few cross country ski trails that I hadn’t toured during my numerous visits to the Methow Valley. 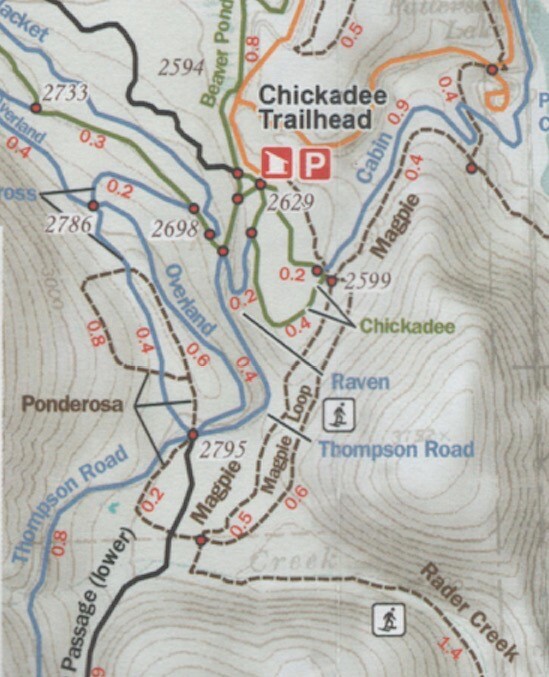 As a ski trail, it’s a halfmile loop that circles back to the Chickadee Trailhead. As a hike, I reached a junction with the Magpie Trail in just a few minutes. Magpie is marked on Winter Trails “Skier Steve” (provisional name, Methow Trails, 2015) as a snowshoe trail. As a hike, Magpie was marked as closed to mountain bikers and open for horse travel. I used Magpie to position myself below the northwest slope of Herringbone Hill. As I ascended this slope, the Sun Mountain Lodge was visible behind me. Continuing up the north ridge, I looked down to Patterson Lake and across to Patterson Mountain. At the top of Herringbone Hill was a small sitting-rock and a seldom-used ﬁre ring. It was a ﬁne viewpoint for admiring the topography. The forested valley of Rader Creek hid trails such as Rader Creek, Inside Passage, and Thompson Ridge. A good portion of an abandoned ski route known as the Elbow Coulee Trail (“Sun Mountain,” 1983, Don Portman) that headed towards Twisp was visible. To the northwest above Mazama, both Cougar Mountain and Fawn Peak were visible. The summit of Cougar Mountain was part of the Diamond T Ranch trail system more than three decades ago (“Rendezvous Ski Trails,” Rita Chandra Kraft, 1980). Back then the ridge leading toward the summit of Cougar Mountain from Rendezvous Pass was occasionally snowmobile groomed for skiing. The Diamond T Ranch staff provided guided trips there for paying customers. The current Cougar Mountain Trail near Rendezvous Pass circles around Cougar Mountain, staying several hundred vertical feet below the summit. I skied that trail during ski seasons 1998-1999 and 1999-2000. 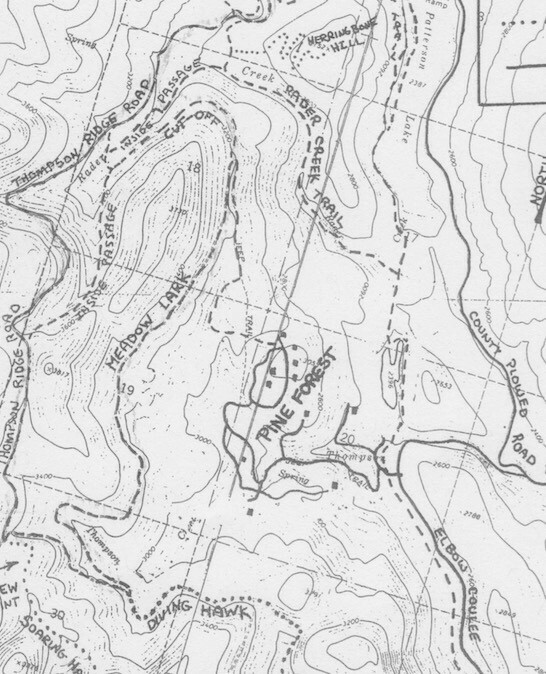 Gunn Ranch Road was also on Kraft’s cross country ski map. While exploring that approach to the Rendezvous trail system (May, 2015), I hiked the southeast ridge of Cougar Mountain, then traversed over the top of Point 4058’ (South Cougar Mountain, provisional name) to loop back to my starting point. Fawn Peak was a guided trip from the Diamond T Ranch (“Rendezvous Area Ski Trails,” Kraft, 1981). The east ridge from Rendezvous Pass over Rendezvous Peak to Fawn Peak was an advanced ski trip with long views in all directions. 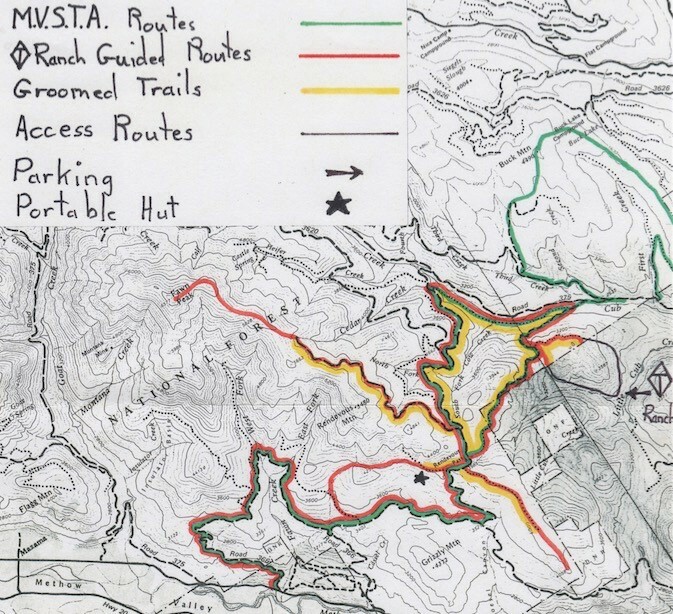 In 1982 Ed Enoch Kraft proposed to the Forest Service that the Diamond T Ranch site a shelter high on the east ridge of Fawn Peak, an idea that never came to fruition. In May, 2015 I hiked the south ridge of Fawn Peak, starting from a Forest Service road not far from the former site of Fawn Shelter. A map reference to Fawn Shelter was last seen on Winter Trails “Skaters Janice & Carol” (Methow Trails, 2011). I was also impressed with the lofty views from the summit. I would have enjoyed staying longer on the top of Herringbone Hill to contemplate more memories of my research of the Methow Valley ski trails. But the temperature was dropping, and I wanted to complete a loop of my own before it was dark. I dropped off the summit down the southwest slope, recrossing Magpie a second time. I considered crossing Rader Creek to access the Rader Creek Trail, but it seemed a bit brushy to cross the watercourse. Instead I stayed along the base of Herringbone Hill, then headed left towards Inside Passage. I used neither map, compass, nor GPS device. Three years of studying the Sun Mountain maps for my mapping project had hard-wired the terrain inside my head. Following Inside Passage took me to the junction with Thompson Ridge Road. I could have kept it simple by following this road down to the Chickadee Trailhead. However, a bit of remaining light encouraged me to cross Thompson Ridge road and hike Overland Trail. At the Criss Cross junction I followed Criss Cross Trail, then a short piece of Yellow Jacket Trail to return to the Chickadee Trailhead just before dark. Feeling pretty satisﬁed with my outing, I headed back to Sun Mountain Lodge to join my wife for the remainder of the evening. Saturday was rainy. Settling in with a good book would occupy the better part of my day. But a brief break in the weather mid day was not wasted. I hiked west from Sun Mountain Lodge on the Kraule Trail, intending to loop back to the lodge on View Ridge Trail. This loop of about 1.5 miles would have included extensive views,if the weather had been better. 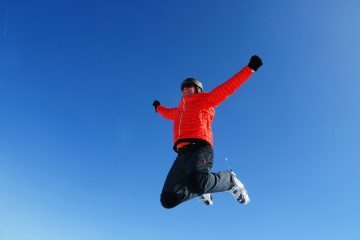 Kraule is a snowshoe trail in the winter, and I followed it out to Hough Hut. I noticed that a vault toilet had been installed near the hut since my last visit there while skiing Little Wolf Creek Trail. My thoughts were about View Ridge Trail as I hiked back to Sun Mountain Lodge. Several Methow Trails (formerly MVSTA) brochures over the years included cover photos taken from the trail which showed the grand view of Gardner Mountain in the background. During my research Don Portman told me that the trail’s combination of rewarding views and quick access from the lodge were factors in so many pictures being taken there. View Ridge was another of the short trails in the Sun Mountain area that I had never skied. It seems that I always head out on the trail system from the Chickadee Trailhead instead. Halfway back to the lodge are a series of small knobs. One is slightly higher than the others, and on it is situated a large water storage tower. The terrain seemed familiar, and the memories came back. Janet and I had last stayed overnight at the Sun Mountain Lodge in late March, 2005. It was a rainy weekend and too far beyond the winter season for cross country skiing. On a wet evening we set out from the lodge on the View Ridge Trail for a short stroll to the closest knob, Point 2951’. A hiking buddy has coined the term “cheap summit” for easy to reach high points such as this. The term comes not for the lack of a good view, but for the minimum of physical effort to get there. February, 2011 Janet and I had ridden a horse-drawn sleigh on the View Ridge Trail. Out past the water tower an outﬁtter had set up a large canvas tent, complete with a wood-ﬁred stove and picnic tables. We enjoyed a sumptuous meal as a family get-together the night before my nephew’s wedding. I remember everyone being really bundled up for the cold ride. It wasn’t skiing, but we did slide along on runners. Given my lifelong interest in maps and four decades of cross country skiing, perhaps I interpret my surroundings a bit different than others when I visit the Methow Valley. I place myself in the valley, connecting with the cross country ski trails (present or past) that always seem to surround me. I feel enriched knowing about the history of the trails and how the trail system has evolved. Perhaps my writing has touched others to consider the Methow Valley trail system in a similar way. Charles Hickenbottom is a retired teacher from Wenatchee. He has previously written a book for the educational community about how to teach map skills to elementary-aged students. He has also written for Wenatchee Outdoors, Washington Trails Association, Summitpost, Renton Chronicle, and the Enumclaw CourierHerald. An unpublished piece was written for his extended family, documenting the contributions of family members to the armed services, beginning with World War II. His book, Cross Country Ski Maps of the Methow Valley – A Study of Trails and Mapping, can be checked out from libraries in Wenatchee, Twisp, and Winthrop. The maps referenced in this article are part of a four-binder set of historical artifacts housed in the Twisp Library. His book is for sale at Arlberg Sports in Wenatchee, Trails End Bookstore in Winthrop, and Goat’s Beard Mountain Supplies in Mazama. Hickenbottom contributed his book and artifacts to the community and receives no income from the sale of the book. Hello, An update on the book: In winter 2017-2018 I donated the publishing rights for my book to Methow Trails. Proceeds from the sale of this book go to the nonprofit group, Methow Trails. Copies of the book are on sale at the Methow Trails office in Winthrop.